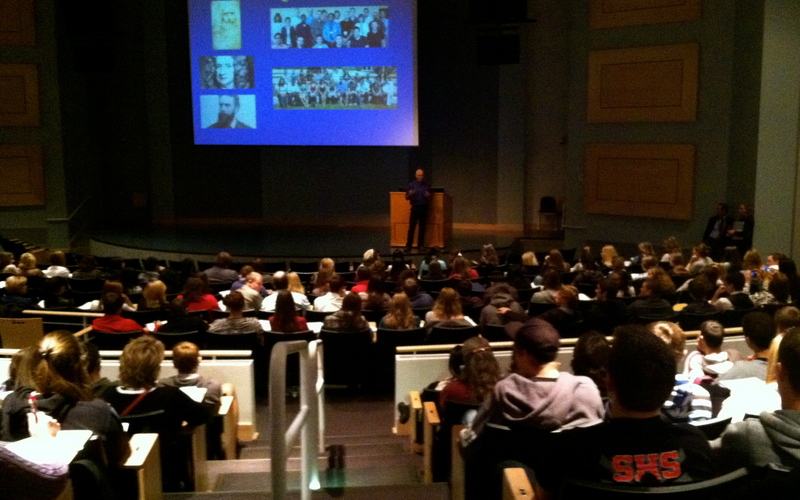 The Department of Bioengineering‘s Dr. Richard Weir presented to approximately 450 high school students at The Colorado-Wyoming Junior Academy of Science Health Science Seminar at the Anschutz Medical Campus. Many of the students had boarded school buses before dawn to make the five-hour trip to Aurora. But the trip was well worth it. Weir’s presentation not only introduced students to his research in Neural Engineering, Biomechatronics and Rehabilitation, but he also discussed the future of Bioengineering as a whole. The audience seemed fascinated by Weir’s cutting-edge research, asking questions about next steps and anticipated results.